Tucked along Putah Creek in Winters, California, Martinez Orchards is graced with fertile sandy loam soils. Martinez Orchards produces field grown dormant grafted vines and field grown dormant rootings that are the envy of the industry. Martinez Orchards’ grading standards are the most stringent in the trade and are supported by strict quality controls including meticulous care of increase blocks, proper field rotation, adequate spacing between plants and above all, never rushing Mother Nature. The result is highly sought after plant material of distinction and quality. Produced with the same rigorous quality control standards as our dormant material, these plants are grown in a custom soil mix, a premium potting system and bottom heated greenhouses to ensure quality. The result is a vine with an exceptional root system, balanced growth and strong tissue for vigorous growth and excellent performance from day one. What makes outstanding grapevine plant material? At Martinez Orchards it starts from the ground up. Acres of rich loam soil proudly carry a top-index rating, no soil is more fertile in California. The rootstock-conducive climate found in Winters, California also provides the proper mix of cold winters and hot, dry summers. In fact, cold temperatures ensure dormant plants and cuttings receive sufficient chilling hours. Add Martinez Orchards’ close proximity to the waters of Putah Creek and it’s a location ideal for the propagation of grapevine plant material. Plant size and quality truly set Martinez Orchards apart. In the nursery row, appropriate spacing allows cuttings to develop naturally without excessive fertilization. Proper crop and field rotation eliminate the need for soil fumigation. In the greenhouse, an excellent soil media and potting system along with underground heat develop robust green growing plants ready to go at delivery. These uncompromised plants are consistently fuller and taller in both diameter and in top growth. Healthier, hardy plants simply perform better and have a greater chance of warding off disease. Not surprisingly, the #1 plants sold by Martinez Orchards exceed specifications set by the California Department of Food and Agriculture— earning a grading scale that is without equal. More rootstock and scion cuttings are grown in Martinez’ own increase blocks than are actually used, allowing Martinez to select only the finest material for planting. Through natural selection, weaker plants are removed and replaced with cuttings from the strongest plants. The entire process is low-tech and as hands-on as possible. Plant size and quality are meaningless if the plant material doesn’t start out as clean as possible. At Martinez we annually inspect and virus test our increase blocks, nursery row and any outside sources of plant material. The focus is on vector spread and economically important viruses. Results are shared and we encourage customers to participate in the process. Our objective is to provide the industry’s cleanest material and to foster a true team approach between Martinez and you, our customer. Not all rootstock sold in California is 100% certified. This is clearly where Martinez Orchards has an edge. Every cutting is originally sourced from FPS (Foundation Plant Service) at UC Davis. 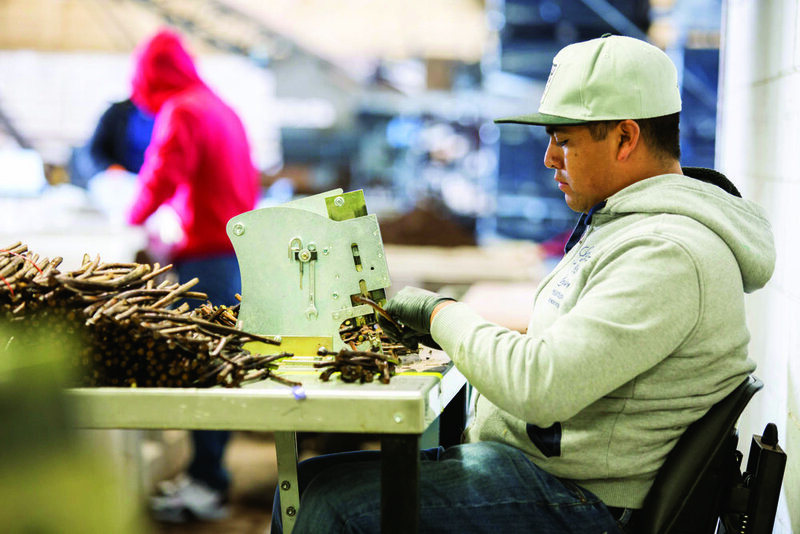 To maintain full certification, The rootstock and scion grown in Martinez Orchards’ increase blocks are inspected each year by the California Department of Food and Agriculture. Starting out with clean planting material from Martinez extends the life of a vineyard. Dan Martinez Sr. began growing grapevine rootstock in 1969. There was no strategic business plan, just a strong work ethic and a promise to only sell plants farmed on his land. Plants so good that he would buy them himself. Today Dan’s son, Dan Martinez Jr., along with longtime business partner Santiago Moreno and industry veteran Ernie Bowman, continue this proud family tradition of hard work and commitment to quality. While Martinez Orchards has grown over the years to produce millions of plants annually, the boardroom remains exactly where it should be – out in the fields. Martinez Orchards is one of the most trusted and respected names in the grapevine nursery business. We’ve earned that reputation through years of hard work, honesty, integrity and a commitment to our customers. We provide unequaled support with our knowledgeable sales people and highly experienced production team. We know successful plantings allow us to fulfill our promises. We strive to build lasting relationships with our customers based on a foundation of mutual steadfast trust. Please complete the form below for questions or pricing. ® Copyright 2018, Martinez Orchards, Inc.